From our mini-Friesen/Garcia family camp in Morro Bay, which ended August 5, to Lake Almanor on August 6, we traded the ocean for a lake, and Littles for young married couples, just like that. Our transitions all summer have been rapid, you could say (but that’s not unusual, really). Ray and Carol Johnston invited us to speak for an intimate gathering of young married ministry couples connected with Bayside Church’s thriving ministry, and we happily agreed. So Sunday, August 6, we flew to Sacramento, rented a car, and drove to the Johnston cabin we had long heard about, but had never been to. That began 48 wonderful hours of interaction with some of our dearest friends (we’ve journeyed with Ray and Carol for just over 30 years now) and with a group of “young-in-ministry-and-in-marriage” couples, which is one of our favorite demographics. Gatherings like these are so energizing for us because we believe that solid foundations that support “best practices” position a young couple positively as they set the trajectory for their personal as well as ministry lives. This special group of 9 couples was delightful in every way, but we were especially impressed by their eagerness to learn and grow. Journals and pens in hand, they took copious amounts of notes and asked thoughtful questions. All are concerned about protecting their marriages in the context of demanding ministry calls and wanted practical advice regarding how to do that. Right in our wheelhouse. Forty-one years in to our ministry life together, we are so thankful that God pressed on our hearts early on to “not sacrifice our marriage or our children on the altar of ministry.” We know that doesn’t guarantee results, but it has made us vigilant through the years to protect those most valuable relationships as best as we could, and thankfully His grace has filled in the gaps created by our own brokenness. It was such a joy and an honor to join with Ray and Carol for this event. We can never get enough time with them, but we were so grateful for what we did have. So thankful for over 30 years of friendship and partnership in ministry with Ray and Carol Johnston. Marriage and ministry mentoring with these special young couples. Sweet memories of our time with this crew of young ministry folks. We drove out of Lake Almanor early afternoon on Tuesday, August 8, to catch a flight out of Sacramento, and by midnight, we were in San Diego to spend a week with my mom. A whole week. That doesn’t happen very often due to our crazy schedule, but we took advantage of the “gap” before our next speaking engagement and hung out with her. What a treat! My mom is relatively low maintenance and very grateful. Our days were simple and leisurely. We helped her with a few small projects, “got her out” of her condo at least once a day, negotiated for a “new” (Craigslist) wheelchair for her (replacing the insufficient transport chair she had been using), and heard stories of days gone by. She is pretty amazing for almost 88: still driving when necessary, keeping up with technology, sharpening her mind daily with news, reading, and Jeopardy, and spending a good portion of every morning praying for those she loves. We were inspired by her and took careful notes on how to age gracefully. My mom with four of her seven children. Lisa delighted her Grammie and us with a quick visit on Sunday, and my three sisters who live nearby popped in and out during our visit. It was a great time which also ended too quickly. We “Amtracked” to Santa Ana on Tuesday, August 15, and spent a few hours with our dear friend Wendy Turney, before getting a rental car and driving to Santa Clarita to have an early birthday dinner honoring Brandon and Paul, who are birthday buddies. Such a fun evening was had celebrating Papa and grandson, separated by 60 years—and that gap was certainly reflected by the gifts exchanged: Papa got clothes, Brandon got a bike. :) Both were happy. The birthday boys are celebrated at Lucille’s BBQ in Santa Clarita. Brandon was very happy with his new “ride." After walking Brandon to his 1st grade class Wednesday morning, we hit the road and drove to Hume Lake Christian Conference Center. Having been involved in Christian camping our entire marriage (and Paul his entire life), we were delighted to accept the invitation extended by Hume’s executive director Dathan Brown, to come and spend a few days. During those days we met with him and with Hume’s program directors to talk about future partnering possibilities, especially related to their marriage conferences. 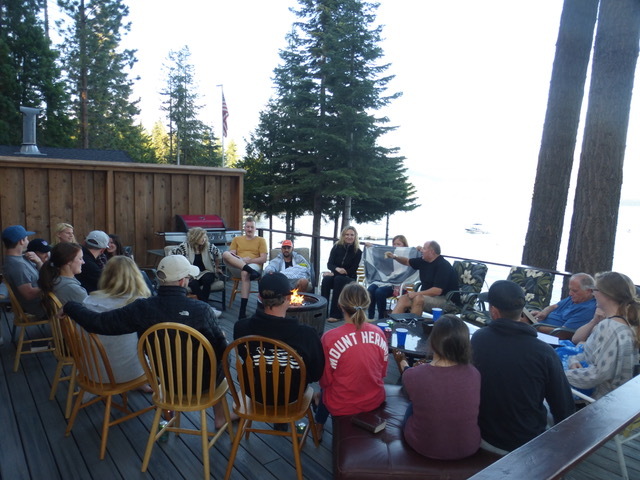 Of course, our passion for family camps bubbled over, and though Hume currently only has one long-weekend family camp (over New Years), the program directors were intrigued by the possibility of expanding that during their non-summer seasons. Only God knows what the future holds, but it was sure fun to swap ideas as we got to know one another. We were very impressed with everyone we met and with the Kingdom values which govern Hume Lake. We also had time for some fun . . . and in our short one full day there, we hiked around the lake three times, did some stand-up paddle boarding (me) and kayaking (Paul), swam in their beautiful pool, and hung out with friends. During that afternoon, we had lunch with Aaron and Katie (Geerdes) Linderman and their adorable boys (who have lived/worked at Hume for seven years now), “ran” into Steven and Ezekial Crawford (high schoolers who have grown up at CBS family camps and were attending Hume that week with their church), as well as Dave and Kathy Heinz (family campers we’ve known for almost 30 years). We met several Bayside friends as well as “friends of friends” who just began working at Hume. It’s truly a small world after all. Great time with Aaron and Katie (Geerdes) Linderman and their boys at Hume Lake. LOVED “bumping” into Dave and Kathy Heinz at Hume Lake. We were so thankful to get our family camp hugs in without family camp. Each of those “serendipitous” meetings were gifts from a loving Father, who knows that our deepest grief of this summer has been the lack of connection with hundreds and hundreds of deeply loved family campers. He has made us feel very loved. Very personally loved. And the loving continued, as we drove out of Hume and stopped in Clovis to have lunch with Marshall and Terrie Sorensen, family campers since the late 70’s. Three generations of Sorensens have made family camp part of their family ethos/fabric/tradition and our hearts for all of them are inexpressibly deep. We laughed, talked, and cried for three hours over a delicious “farm to table” lunch prepared by them, and ended our time with a rolling-on-the-floor-laughing time as we tried to take a good “selfie.” Clearly we’re all over 60. I finally set the timer on my camera. :) Such sweet fellowship with truly great people of God. Marshall and Terrie Sorensen . . . salt of the earth . . . precious friends. Pressing on, we drove to Oakhurst to speak for the Fresno Armenian Presbyterian Church’s family camp. Greg and Sossi Haroutunian became very dear friends when Greg pastored the 1st Armenian Church of Belmont in MA and they attended family camp with us at Berea. Four years ago, Greg accepted the lead pastor position at FAPC and invited us to speak at their third annual family camp weekend August 18-20.We’re so glad we could! It was such a treat to be reunited with Greg and Sossi and their 3 great kids, as well as to meet a good portion of their congregation who gathered at the ECCO retreat center for this brief but powerful weekend. Besides speaking four times, Paul did morning family devotions and we supported the Family Talent Night by attending. :) In between, we connected with many dear people and heard some pretty remarkable stories. The children gathered for devotions and were very engaged. This is the goofy shot of the family camp. With promises to come to Fresno to partner in the future, the conference ended after lunch on Sunday and families drove back down the mountain with renewed vision and hope for their homes. Many expressed that God had met them in significant ways. All praise is His. Our plans to finish this month-long west coast tour camping for a few days at Yosemite National Park were threatened by a large fire burning at the south fork of the park, but with the Internet’s assurance that all roads were open, we decided to go for it. I grew up camping at Yosemite and it was there that my love for nature, hiking, and being outdoors was born. Always an avid hiker, my father would “march” us (at least five of the seven kids) up those falls (Vernal, Nevada, and even Yosemite), successfully bribing us with portions of “Powerhouse" candy bars at each rest stop. My mom would stay at our campsite with the youngest of the crew who were not hike-ready. So many unforgettable childhood memories were made in that majestic, granite-wall lined, matchless-in-beauty valley, Paul and I continued the tradition with our own family. Though we didn’t keep pace with the annual visits my family of origin made, we went when we could and our last two visits as a family included climbing Half Dome 10 and 11 years ago. I only found out then that climbing that iconic feature of the park was on my father’s bucket list. Turns out he never did get to climb it, as his commitment as a dad was sticking to hikes he could do with his crew of 7 kids. By the time we were grown up, his knees were too bad to do it. I’ll forever be grateful for parents who gave us such life-shaping opportunities. S’mores around the fire with Eric and Stephanie Lingren, and Katie, Gracie, and Matthew. We spent Monday hiking Yosemite Falls. The last time we hiked that trail was in late October of 1980, when Kari was 4 months old and Paul carried her to the top in a front pack. Three days after we hiked it, a rock slide killed three people on that exact trail, which closed it for several years while it was being rebuilt. It was very memory-evoking to hike it again. When we got to the top, two young college men (with whom we had shared bug repellant an hour or so earlier) were pulling out their special glasses so they could safely observe the eclipse. True confession: though we had heard occasional talk about the eclipse, since we’ve been off the grid most of the summer, and since we were paying no attention to the date, we might’ve been the only two North Americans who were not just unprepared for this rare event, but also unaware it was happening that day. Our grandchildren would’ve been horrified. Fortunately for us, these two guys had an extra pair of glasses they gladly gave us and we joined the rest of the world observing this spectacular display. From the top of Yosemite Point. We felt very, very blessed. That’s us on that rock at Yosemite Point, from where we viewed the eclipse. Tuesday, in spite of ever-thickening smoke in the valley from the still raging fire, we took a shuttle bus to Glacier Point and hiked the Panorama Trail down to the valley floor. This was a first for us, and except for not being able to see the valley at all due to the smoke, we loved this 8.2-mile trail which wended past Illilouette Falls, Nevada Falls, and Vernal Falls, all the while displaying incredible vistas of the huge granite walls forming El Capitan, Half Dome, North Dome, and even Yosemite Falls. Our disappointment in not seeing the valley was mitigated by the wonder of everything else we saw. We cannot wait to do it again. At Glacier Point to start the Panorama Trail to the valley, with Half Dome looking over over shoulder. The smoky haze obscured the view, but you can make out Nevada and Vernal Falls if you look closely. We drove out Wednesday early afternoon, but not before getting up to see the sun rise behind Half Dome and doing a small hike to Mirror Lake. We packed up, bid farewell to the lovely Lingren family, and left our hearts in Yosemite. One final sunrise behind Half Dome. Mirror Lake . . . appropriately named. One last look at all three tiers of Yosemite Falls. And thus endeth our month-long west coast junket. As we reflect on the myriad of ways God has met us and personally communicated His love for us, we are humbled, grateful, overwhelmed, and in awe. The beauty of His creation in the natural world has only been eclipsed by the love that has been extended to us by so many.